In past entries about Rolex shopping, I alluded to a "major purchase" at Rolex, and I know there is at least some interest in what that purchase was. The secret is revealed. Raphael Boots, size 39, Xslim (12.25"), Xtall (19.5"), at the Rolex special price of 25% off. 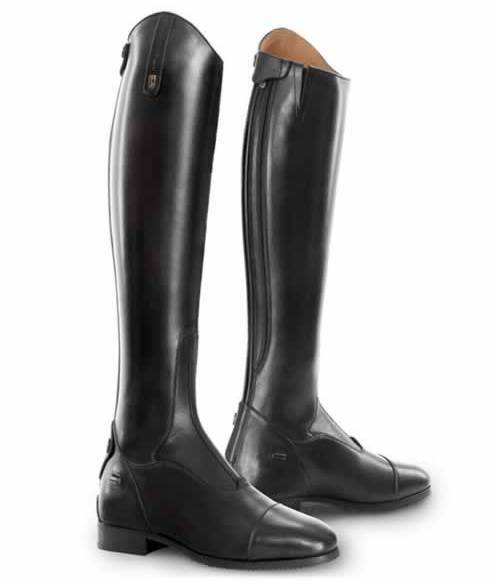 As background: I have been eyeing the Raphael boots and the Deniro boots in Smartpak -- they aren't custom but their sizing extends to the very tall and very slim leg, and the pricing is far below custom pricing. Still, finances did not allow, I told myself. That all changed in the excitement of the Rolex Festival Marketplace. Day One of Rolex, I wandered into Bit of Britain.The Tredstep rep was there, and there was a Rolex Special Price on Tredstep. It was the Retail Perfect Storm. My size had to be special ordered, but they assured me I could a) return them, b) exchange them, and c) get the Rolex pricing. They arrived last night. They are perfect. Goofy pose, but trying to show both inside and outside of the boot. What's missing? The pain, for one. No, they are not dressage boots, they are dress boots. I have my Petries, but after learning that the "stiff boot" phenom was all about appearances (per the Chronicle Forums discussion thread I started), I am leaning toward going back to a softer boot. If you are interested in Raphaels, or Tredsteps, let me tell you that they hug your leg all the way up, defining the lower calf nicely. From trying the slims (not xslims) I can tell you that the wider sizes are mostly wider at the calf, they still follow the curve of the leg. And they are comfy. In buying these, I have closed the door on "the brown boot," the Deniros available from SmartPak. Those look AMAZING!!! Wow. The tack store lady took one look at my skinny pins and said she'd put me right into Donatellos. Haven't tried them on yet but I bet anything they will fit (and unlike you, height is not the issue). They totally look custom, yay for you! Gorgeous - and I am jealous of your skinny legs! Now that you've had them for awhile, how are they in the saddle? Have you noticed any huge difference in your riding or the horse's response with the softer boot? I generally ride in Petries, but they destroy the backs of my knees on the days when I have to get on one of the hunters (gotta love the shorter stirrups for that), so I have been browsing for softer boots. Initially I was thinking of getting a softer pair of field boots for days when I flat a hunter, but after seeing your blog, I'm leaning towards a softer pair of dress boots that I can wear regardless of whether I'm on a dressage horse or a hunter. I read the thread you started on the Chronicle Forum and it seems that some feel the super stiff boot is all about fashion, while others feel that it serves a tangible function. In my mind, I wonder if a boot could/should really make that big of a difference in our riding. If we progress to the point that our aids are clear and accurate, shouldn't the stiffness of the boot become irrelevant? Anyways...looking forward to hearing your thoughts on the "road test" for your Raphaels. Hi there! Just curious how your Raphael boots have held up? How would you rate them now?